With the academic year coming to a close and around 45,000 pupils across Scotland getting ready to move from primary to secondary school, it can be a daunting time for the youngsters as they embark on the next chapter of their school life. 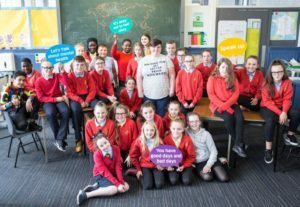 Quarriers Let’s Talk Service works with nine primary schools in the north east of Glasgow to address the impact transition has on young people’s mental health. Having worked together throughout the year, those schools now benefiting from the Transition Support module are Avenue End Primary School and Sunnyside Primary School in Craigend, Caledonia Primary School in Ballieston, Sandaig Primary School and Royston Primary in the East End, Cranhill Primary, Wallacewell Primary in Robroyston, Carntyne Primary and Wellshot Primary in Tollcross. The Let’s Talk transition support offers a range of interventions to ensure that no youngster that is anxious about going to high school falls through the cracks. The programme, run by the social care charity, includes eight classroom lessons around mental health, with additional group work in school for children who have been identified as struggling with the change. Alongside classes on transition support, a major part of the work carried out by Quarriers’ Let’s Talk Service is a weekly group which brings together children over the summer holidays to take part in group activities, allowing them to make new friends ahead of school starting and iron out any worries together. Two boys who hadn’t been identified as being apprehensive about the move and appeared confident in school were also found to be struggling to get their heads around the transition. Andrea said: “During the leavers’ ceremony both boys were upset and within an hour of school finishing for summer, both boys visited my office asking to speak to me. We organised that they attend the weekly summer activity group and they both seemed to get a lot out of it. “After the summer, they started high school. One of the boys still visits us now and again for a chat. He talks about the friends he made at the group and his plans for a weekend away with them. His visits are much less frequent but he knows that if he needs support, he can pop into the office at any time. One of the boys felt so empowered by the support he received he let Andrea know he wants to work for Quarriers in the future to give other children the same support. With its Let’s Talk Service, and the transition support in particular, Quarriers hopes that primary seven children will have the opportunity to explore their concerns about moving on and reach a point where they can feel excited about this next chapter.